Thanksgiving travelers in the East and South on Tuesday and Wednesday will face trouble as a storm brings most areas rain but could also bring heavy snow to a narrow swath. However, much of the rest of the nation will be dry. The same storm affecting the Southwest with snow, ice, rain and thunderstorms this weekend will reach the Southeast with rain Tuesday. From there the storm will turn up the East Coast, tracking into colder air, perhaps causing even greater travel disruptions. After drenching coastal Texas on Monday, the storm will cruise eastward along the Gulf coast Monday night and Tuesday. Travel delays on the I-10 and I-20 corridors are in store from Louisiana to Mississippi, Alabama, Georgia and northern Florida from rain-soaked highways and poor visibility from downpours. The rain can be heavy enough and cloud ceilings low enough to delay flights at New Orleans, Atlanta and other airports in the region. During Tuesday night, the drenching rain will begin to swing northeastward across South and North Carolina to Virginia, along the I-95 and I-85 corridors. Right along the Gulf coast and over part of the southern Atlantic Seaboard, there is also the potential for strong to locally severe thunderstorms. The exact track and intensity of the storm as it swings up or slips off the East Coast Tuesday night into Wednesday night are still in question and hold the key to dry weather versus rain versus snow in some locations. Even if rain were to fall over much of the area, it would be enough to slow travel on the highways and delay a number of flights. Gusty winds would also factor in to delays along the coast, even if the storm were to roll out to sea. Rain is the most likely form of precipitation from Virginia to near New York City then southeastern New England, with the air simply being too warm or the warm waters of the Atlantic Ocean exerting its influence. This includes Richmond, Virginia, Washington, D.C., Baltimore and Philadelphia. If fresh cold air invades the storm, then there could be a period of snow over the mountains from northern West Virginia and western Maryland to central and northeastern Pennsylvania, upstate New York and western and northern New England. If this scenario pans out, major travel disruptions could be in store for portions of I-80, I-81, I-87, I-90 and I-91. Only if the storm were to strengthen a great deal and draw more cold air in would there be a change from rain to snow in New York City, Hartford, Connecticut, and Boston. 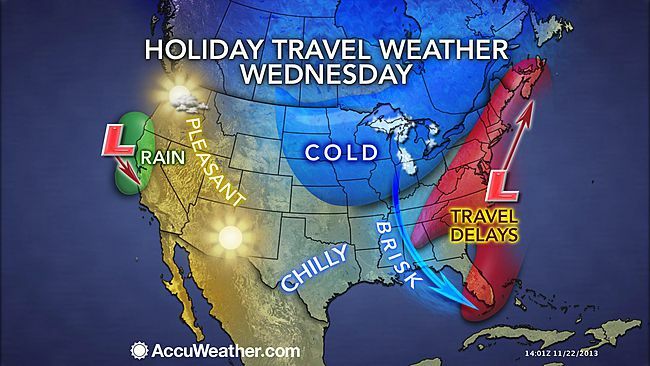 For those traveling on Thanksgiving Day, the storm or its near-miss will likely have exited much of the region. However, some rain or snow is still possible early in the day in northern New England. More details on the track of the storm and forecast for the Northeast will be released on AccuWeather.com as they becomes available. A storm is forecast to move in from the Pacific Ocean during the middle of the week. This storm will has a chance of bringing rain to the I-5 corridor in California to part of Oregon Wednesday into Thanksgiving Day. As a result, there is a chance of wet weather and perhaps travel delays from San Francisco to Los Angeles. Some snow is possible in the Sierra Nevada and over Donner Pass along I-80. Much of the rest of the nation will have good travel conditions. Beware, aircraft and flight crews originating from the South and Northeast could be delayed, perhaps causing ripple-effect problems with a few flights throughout the nation. There will be bands of lake-effect snow over the Upper Midwest, due to fresh cold air moving in Tuesday and Wednesday. The lake-effect snow should diminish in most locations by Thanksgiving Day.